Presented:  Levoy, Marc, et al. "Light field Microscopy." ACM Transactions on Graphics (TOG) 25.3 (2006): 924-934;  Cohen, Noy, et al. "Enhancing the performance of the light field microscope using wavefront coding." Optics express 22.20 (2014): 24817-24839;  Georgiev, Todor, and Andrew Lumsdaine. 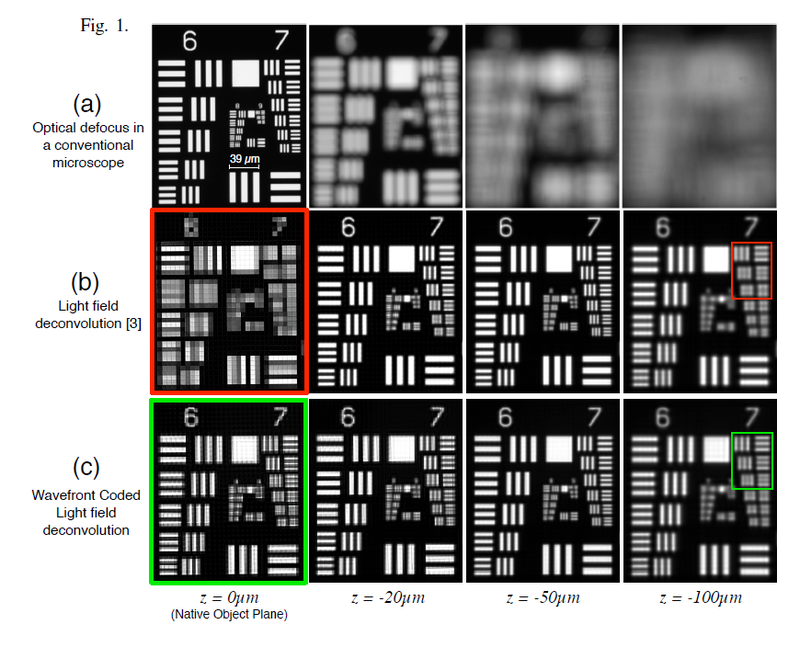 "Superresolution with plenoptic camera 2.0." Adobe Systems Incorporated, Tech. Rep (2009);  Broxton, Michael, et al. 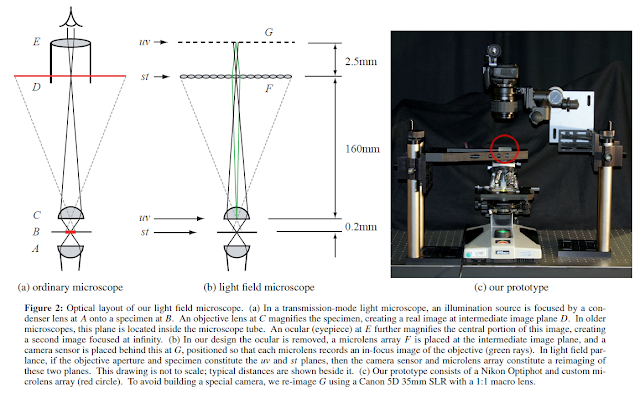 "Wave optics theory and 3-D deconvolution for the light field microscope." Optics express 21.21 (2013): 25418-25439. Second and last ICG Journal Club event of 2016, this time with many people from the Optics group too! Laura was the first presenter of the day, introducing the concept of light-field imaging discussing "Light field Microscopy", Levoy et al. 2006. Nothing comes for free though, and in light-field microscopy there is always a trade off between angular and lateral resolution. In the microscope presented in this article, each small lens in the lens array produces many images of the same point of the object, each corresponding to a different incoming light direction. 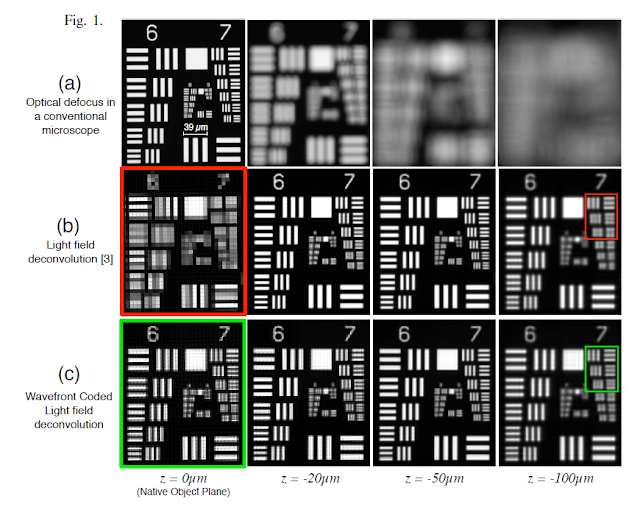 In this case having more (and smaller) lenses results in a better lateral resolution but a worse angular resolution. Prevedel, Robert, et al. "Simultaneous whole-animal 3D imaging of neuronal activity using light-field microscopy." Nature methods 11.7 (2014): 727-730. The volume reconstruction itself can be formulated as a tomographic inverse problem27, wherein multiple different perspectives of a 3D volume are observed and linear reconstruction methods—implemented via deconvolution—are employed for computational 3D volume reconstruction. The image formation in light-field microscopes involves diffraction from both the objective and microlenses. PSFs for the deconvolution can be computed from scalar diffraction theory28.[...]" Kak, A.C. & Slaney, M. Principles of Computerized Tomographic Imaging (Society of Industrial and Applied Mathematics, 2001). Gu, M. Advanced Optical Imaging Theory (Springer, 1999). With Guillem and the three articles he presented we went into more details understanding how light-field imaging works, and we further discussed the deconvolution needed to reconstruct images focused at different scene depths. 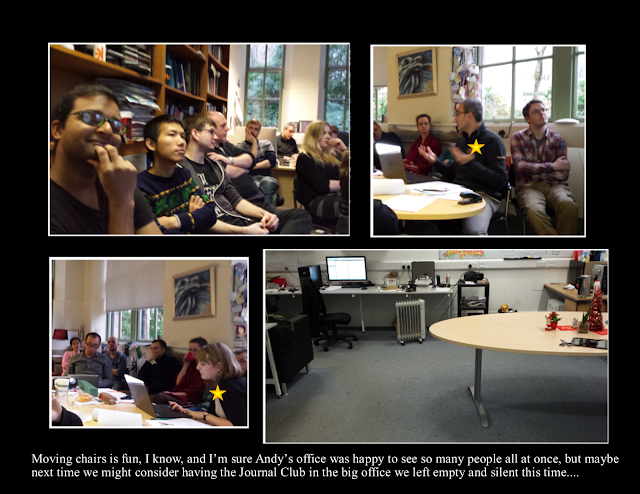 We have only had two Journal Clubs so far, but it was enough for me to notice that I don't fully understand all the discussions that go on during these events, so I must admit I'm probably missing much of what has been said and discussed, but I hope this brief summary gives you an idea of what happened, and maybe even makes you want to come along next time too! Anyway, next time I'd better take some notes and also avoid waiting even just a few days before updating the blog! - Everybody for coming along! !